As every materials scientist knows, crystals are made up of identical stacked building blocks of atoms. The unique arrangement of atoms in the unit cell and the way in which they are stacked determines the physical properties. But with so many ways to arrange atoms in a unit cell and arrange those cells, where do you start? A sensible place is a library of crystal structures. A number exist, with the first attempt to catalogue crystal structures conceived in the mid-20th century. These libraries and databases have grown since then to encompass many thousands of materials. 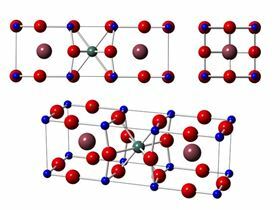 Now researchers from the Navel Research Laboratory, Duke University, St Olaf College, Brigham Young University, and NRCN in Israel have gathered together crystallographic information about nearly 300 crystal structures and put it online in a free library [Mehl et al., Computational Materials Science (2016), doi.org/10.1016/j.commatsci.2017.01.017 ]. But most importantly, the library of 288 crystal structures is going to be integrated with a computational software program called AFLOW, which will allow the structures to be used as the starting point for theoretical studies. The library provides the all the crystallographic information needed: how the crystal structure is commonly described, the space group – which defines how the unit cells stack together, and a complete list of all the atomic positions in two forms – as equations for students and as input files for electronic structure calculations for researchers. The team also pulled together information on compounds with a particular structure and other interesting tidbits, explains Mehl. To top it off is a rotatable image of the structure, which can be viewed from any angle. Sinnott believes that the new database will be invaluable to researchers because it enables structures of interest to be found automatically. To read the full paper, and a collection of other papers relating to AFLOW, please follow the links below. MaterialsToday.com members will be able to download the full text article for free. The thermal conductivity of buckyball-containing superatom crystals is directly related to the rotational disorder within those structures.